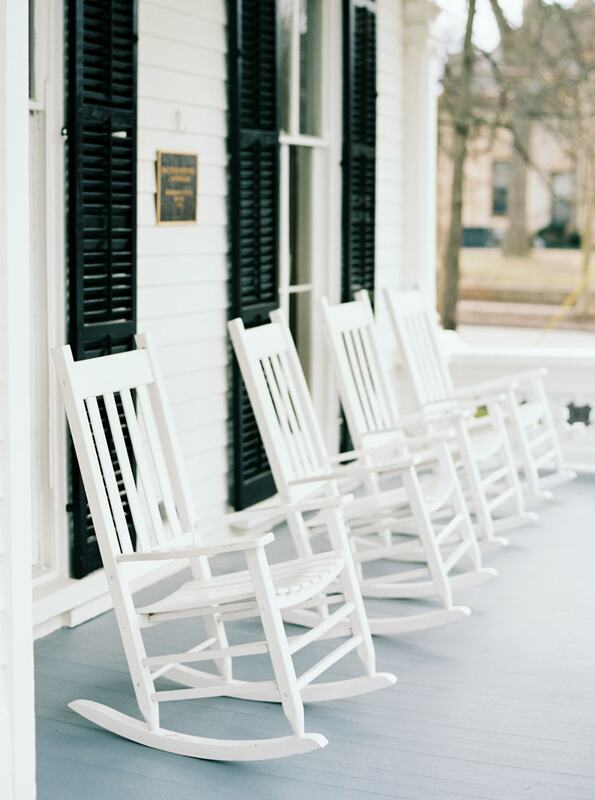 Being Southern means loving your family, abiding by tradition, and embracing gentility in a world that moves at lightning speed. But Southern brides exude an enduring quality that can’t be pegged with words or phrases, and part of that includes a strong sense of self. 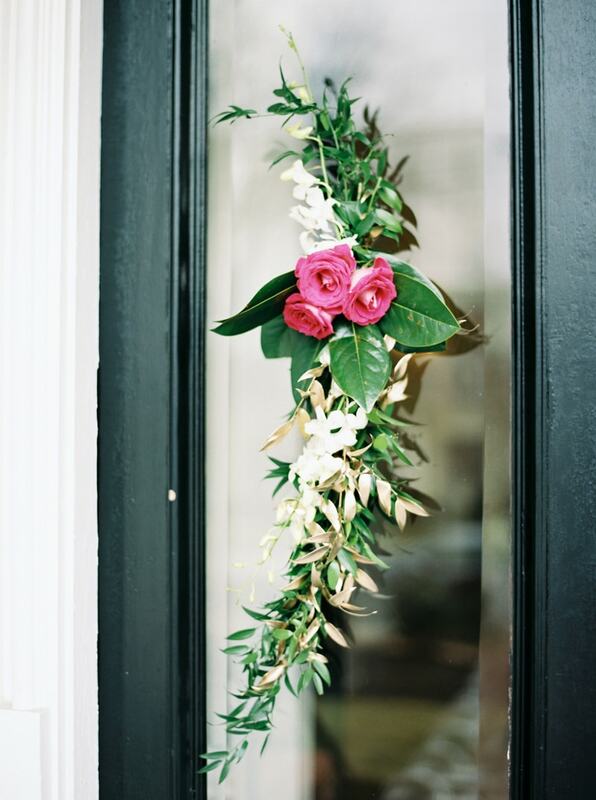 This styled shoot at the Merrimon-Wynne House in Raleigh, N.C., is enveloped by the classic white walls and gardens of the venue, and is brought to life by novel décor and a bride who knows what she wants. 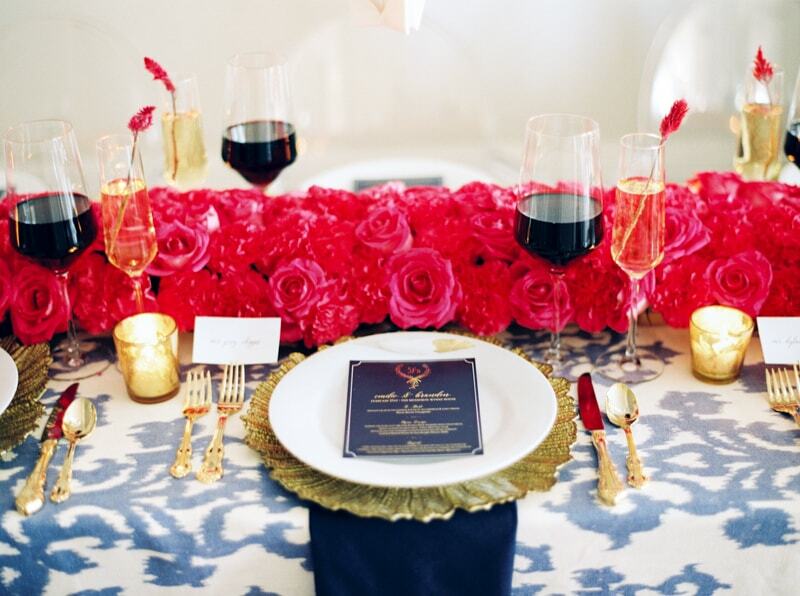 Navy blue is a key color in this shoot, along with a warm metallic gold. 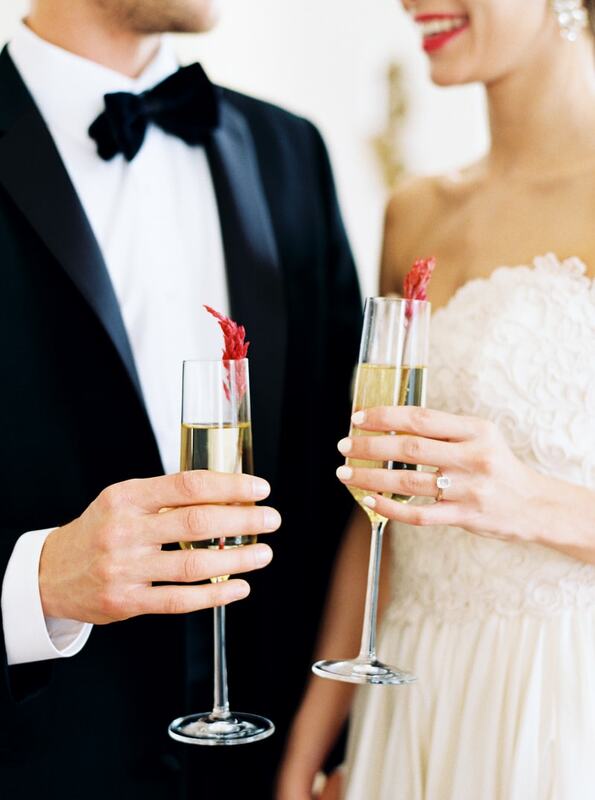 For a pop of brightness, the entire experience infuses the color red in ingenious ways. The bride echoes a graceful silhouette with a strapless lace A-line gown. Her low updo is beautified with a beaded headband and she accents the look with statement earrings. For her, a dose of red means bright lips. And in the mint green room, she looks remarkably picturesque. 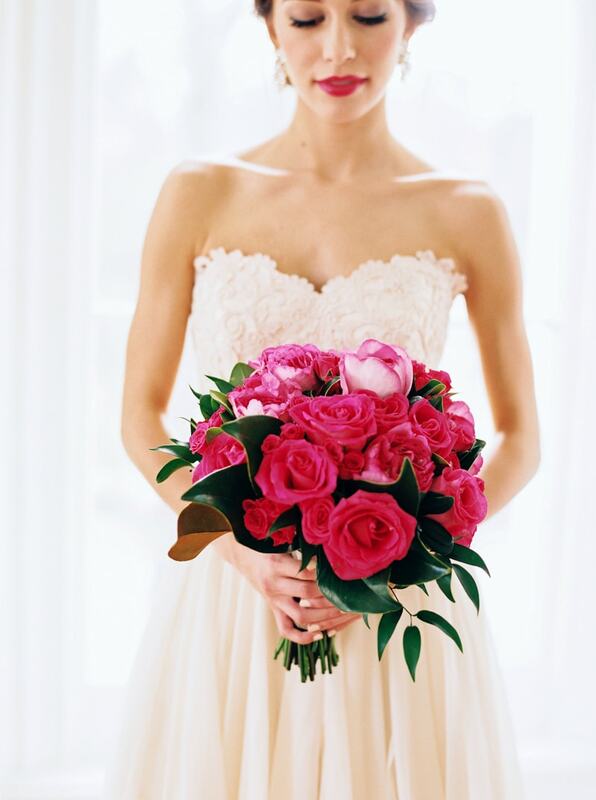 Her bouquet is a beautiful deep-pink collection of plush roses nestled in a bed of greenery. The groom dons a classic black tuxedo, complete with black bow tie. Together, they make a chic duo. As they pause to sit on a dark blue sofa, they only have eyes for each other. The ceremony spot at the entrance is outfitted with clean, short rows of ghost chairs and an arbor fashioned with dangling white flowers. 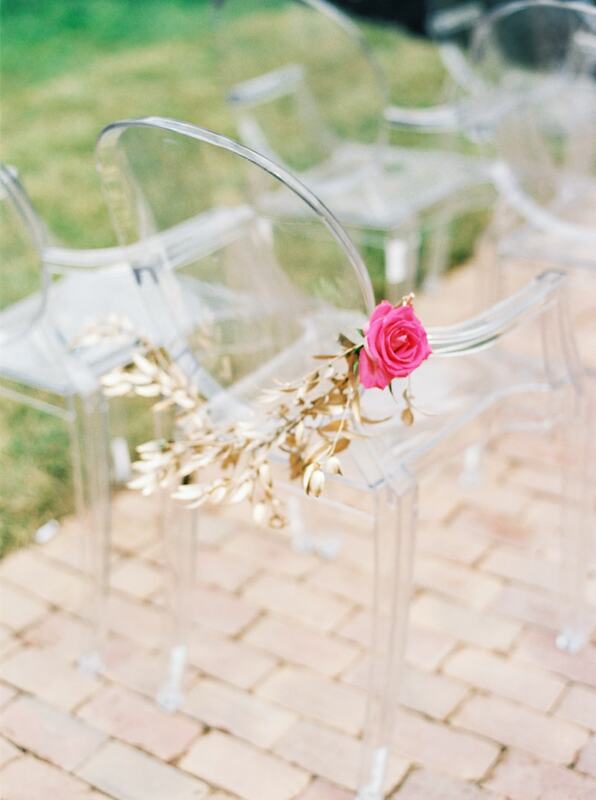 Each chair on the aisle is touched with a small nosegay complete with a pink rose and gold leaves. 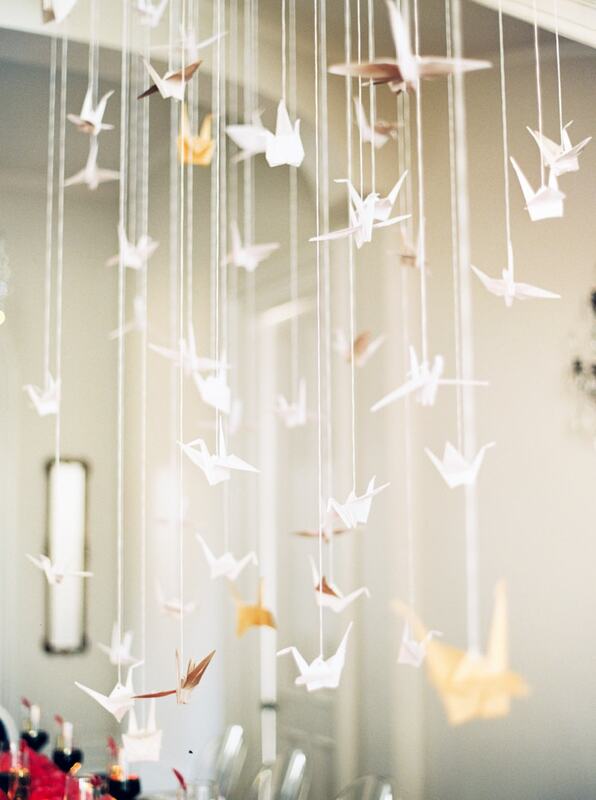 The reception space is utterly exquisite with a fresh take on décor. 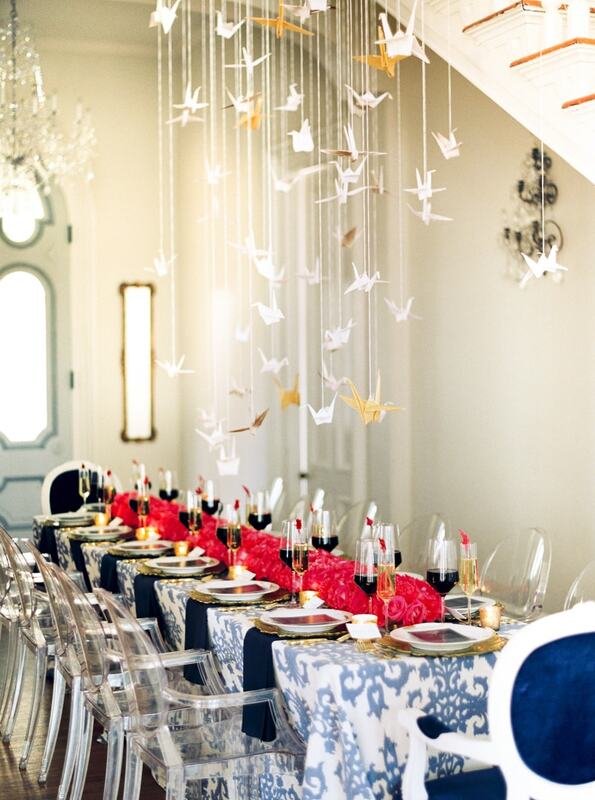 Origami cranes hang from the ceiling above the gorgeous blue and white table. To mimic the look from the ceremony, ghost chairs await guests. 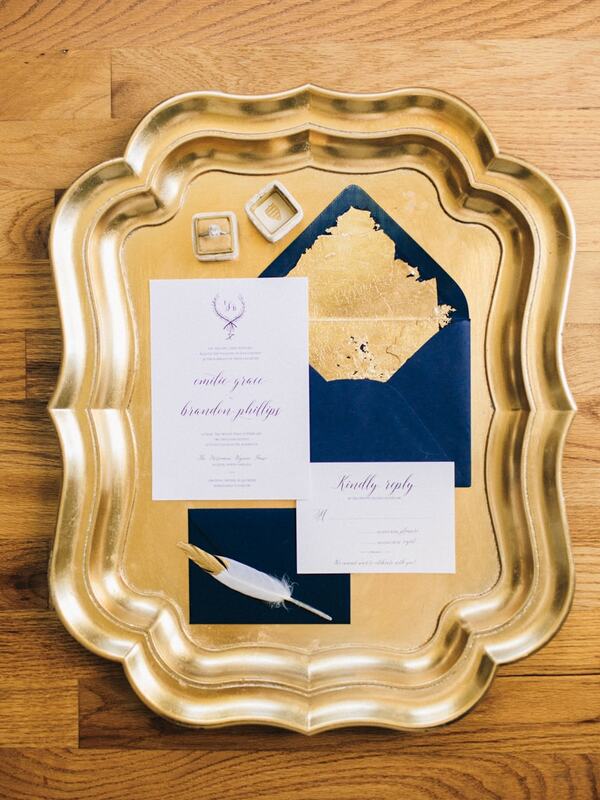 Each place setting includes a unique gold charger, white china, a navy blue napkin, blue menu card, and gold flatware. A runner made exclusively from rich red roses adds a substantial pop of color. The cake perfectly combines all of the design elements into one beautiful dessert. Four tiers, each different in height, have varying looks. Gold leaf, stencil, layered fondant, and crisp bands are topped with a pretty flower cake topper. The space for cocktail hour looks clean and crisp with a bright appearance and sleek additions. A glittering table linen is the perfect spot to hang by as guests enjoy refreshments from a white buffet. A spray of pink dendrobium orchids in a clear vase is an original concept. As the couple makes their exit, one more detail is a must. 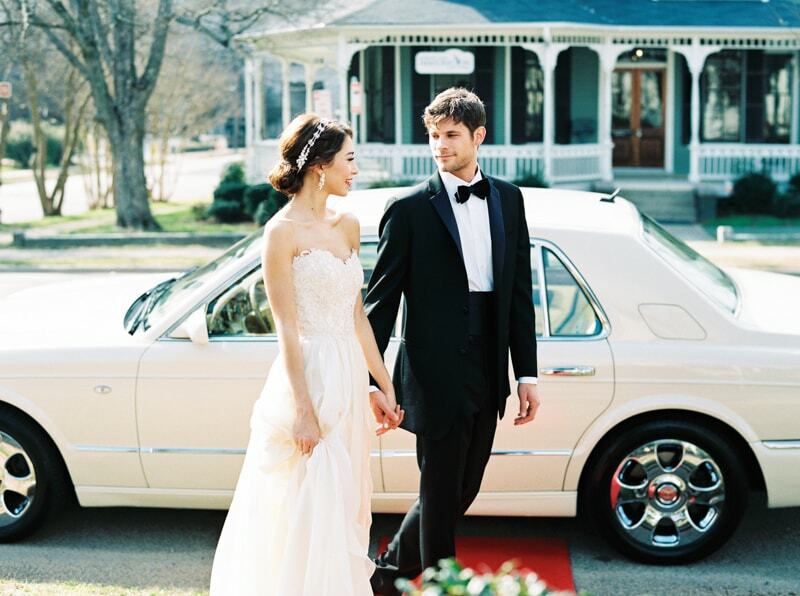 With a Rolls Royce waiting, a bold Southern bride and her dapper groom walk confidently on a red carpet for a rich and alluring finish. Featured in Trendy Bride's 2017 Issue.